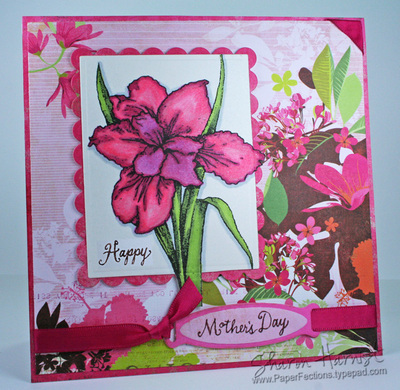 I made this card file for the Spellbinders website Gallery last month. 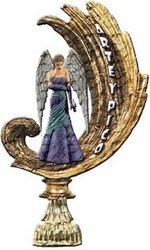 Once you are in the Gallery, you can click on different sub-divisions over on the left side (scrapbook pages, home decor, cards, etc), to see all the projects the design team have created. 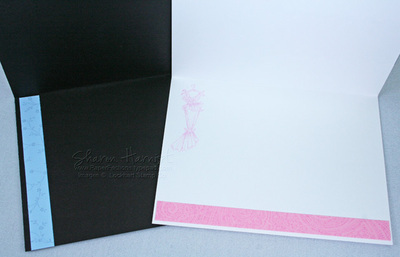 This file is for my daughters to store the names, addresses & phone numbers of their friends. We usually have several scattered pieces of paper they try to hang on to and then find again when they want to call friends, so this will help keep us organized! I started with an unfinished wooden card file by Glue Art & Paper Studio that I got from Doodliedoo. Right now Doodliedoo is undergoing some site work and should be opened back up within about a week, so check back with them then. Until then, though, you might find a retailer for these fantastic wood alterables at a retailer listed here at Glue's site. I painted the file with Making Memories Strawberries & Cream acrylic paint and then covered parts of it with Fancy Pants Sweet Pea & Key Lime collection papers, using a glue stick. Next, I traced the 3" x 5" file cards (another Glue product available from Doodliedoo) onto more papers from those same collections; cut them out and adhered them to the cards to make the front one and alphabetic dividers. Letters were cut from some solid papers (same Fancy Pants collections) using Spellbinders Shazzam and Julius alphabet dies. They were glued onto the front file card, along with a die cut Daisy. The daisy is accented with some Stickles. 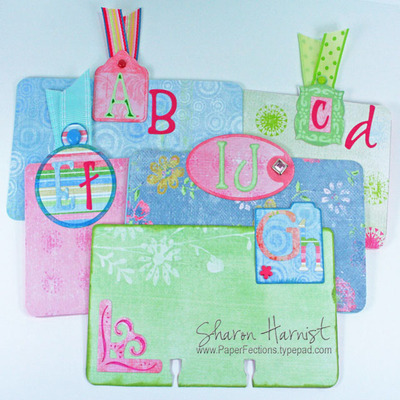 I used a bunch of different smaller dies to create the tabs: A/B: Tags 5, C/D: Charms & Rod; E/F: Variety Tags, G/H: Filing Folders, I/J: Tags 5. Julius and Whimsy alphabets were used for the tabs, along with Decorative Photo Corners on the G/H divider. 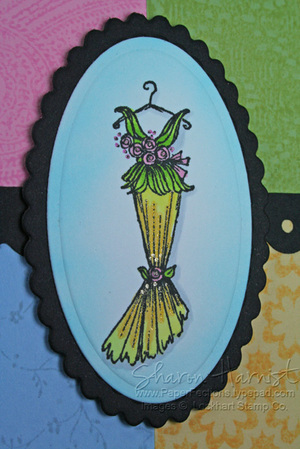 Ribbon is from Sweet Pea & Key Lime collections. I've color coded the cards (purple & pink) -- one for each of my girls, so we'll be able to tell which friend belongs to each of them! I hope you enjoyed this project . 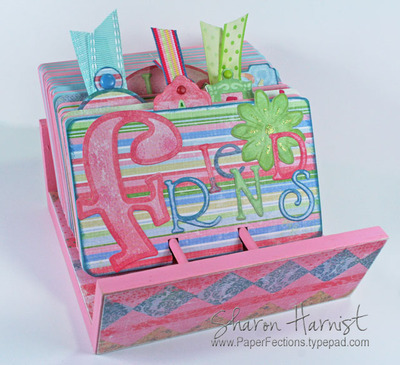 . . the possibilities for these card files are endless and I have another one brewing! For Beate's Weekend Sketch Challenge today, I decided to do my monthly 6" x 6" calendar page. *Note: The greens here are softer and lighter in person -- my camera and lighting were giving me fits this morning! 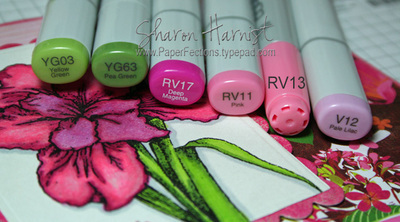 Copic colors used: R81, R85, YG01, YG25, Y21. 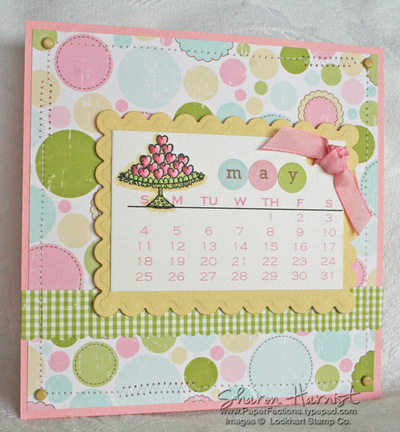 The calendar measures 3.75" x 2.5", is matted with Spellbinders Nestabilities Classic Scalloped Rectangle cut from Prism Frosted Yellow cardstock, and is popped up on dimensionals. 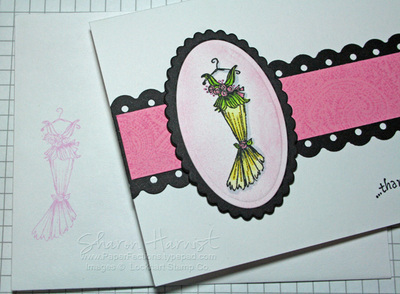 Pink ribbon is Stampin' Up's taffeta. The "May" alpha dot stickers were included in the 8x8 pack of Making Memories Garden Party paper I finally found at Target . . . I adored it when I first saw Michelle use it and was happy to finally find it! I machine stitched the dotted paper to a 6-inch base of Prism Baby Pink, using a combination of straight and zig-zag stitches. 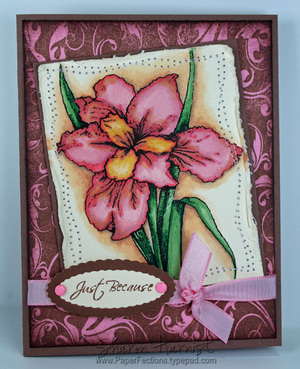 Stampin' Up saffron brads finish off this page. Since I finally figured out how to attach files in my posts, I'll share my Microsoft Excel file (below) of the rest of this year's calendars. I just changed the font color to pink when printing this month's. 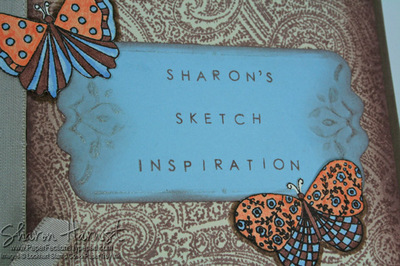 For more inspiration on this week's sketch, check out the samples by these awesome bloggers: Beate, Cambria Turnbow, Charmaine Ikach, Jenn Balcer, Laurie Schmidlin, Lori Craig and MaryJo Albright. I'll be back with something to share with you on Sunday . . . I hope you enjoy your weekend and play along with this sketch! I thought I would continue today with more of my Inchie ABC's. If you have missed these so far, you can click on the Inchie Category from the list on the right sidebar of my blog. 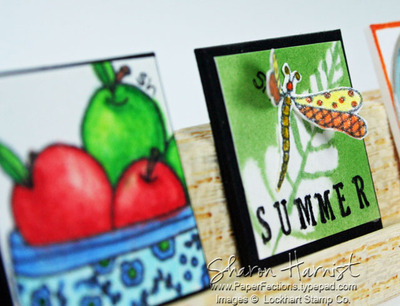 Stamp credits: 1-Lockhart Apples in Chintz, 2-Itty Bitty Dragonfly. Dragonfly is glued by its body to the Inchie base, but its wings are flying free! Notice where I Initialed my dragonfly Inchie? Under its wings! You'll also see in the photos above, how nice and thick this black matboard is and that even the core is black -- all the way thru. It makes for a very sturdy base for your Inchie art and is already cut into 1-inch squares for you! More on this matboard below . . . The white matboard I used for this Inchie (and the black matboard above) is the highest museum preservation quality. The matboard is fade and bleed resistant & lignin-free. 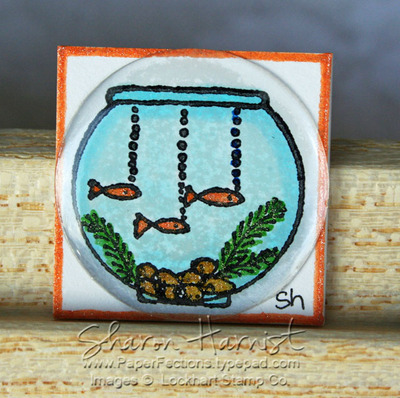 I stamped this Itty Bitty Fish image in Brilliance Graphite Black ink directly on the matboard, heat set it, and then colored the image with Copic markers & Spica glitter pens with absolutely no bleeding whatsoever (and no warping from my heat gun)! This is a Scrabble game tile holder -- perfect for displaying your Inchie collection(s)! You should see THIS idea Karen Lockhart came up with . . . a piece of wood molding she covered with patterned paper -- beautiful! I'll have some more display ideas for you in the next few weeks, as I just got some new product to play with! As a reminder, you can find out more about Inchie art thru Ellen Hutson's new Inchie INKlings blog, devoted solely to Inchies! New challenges will be posted on the 20th of each month. 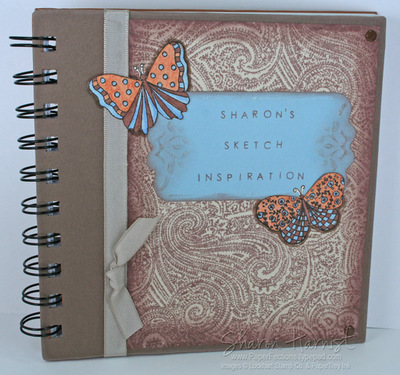 I created this layout for the Spellbinders gallery last month. New items for March from all the designers can be viewed there. I took this photo on our Spring Break trip to California this March. After visiting the San Diego zoo that day, we drove back up the coast to Anaheim and stopped at this beach along the way, to stick our feet in the ocean! Without any prompting, my oldest daughter took her sister's hand and led her out to the water (everybody say AWWWWW!!). I was really glad I had my camera ready! They loved the rolling waves and leaving their footprints in the sand (bottom photo). 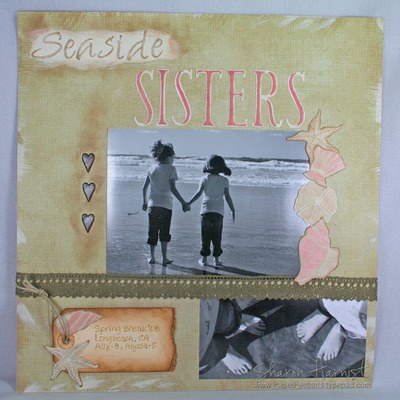 "Sisters" was cut from cream cardstock with Indulgence alphabet. 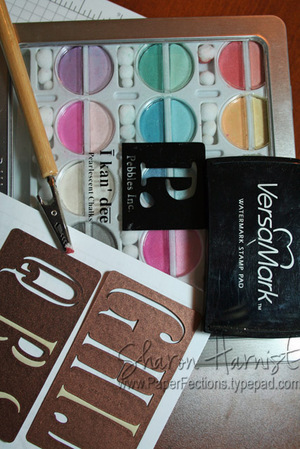 While still in the dies, cardstock was inked with Versamark and then dabbed with coral Pebbles Inc I-kan-dee shimmer chalk. These chalks happen to be the product spotlight at Cornish Heritage this week, where they are on sale! Just click the link above to find them. Journaling was done with Copic's Gold Spica Glitter pen. Distressing and hemp twine finish it off. Thanks for looking . . . I'll be back over the next few days with two more of my gallery projects! 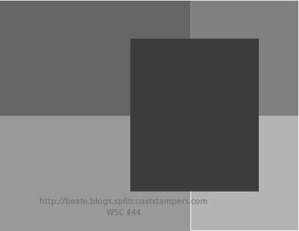 I'm back with another challenge amongst fellow SplitcoastStampers Design Team current and alumni members (affectionately named the Dirty Dozen). This month's challenge was an inspiration challenge, using this photo as our inspiration. Beautiful, soothing room and colors, I thought! 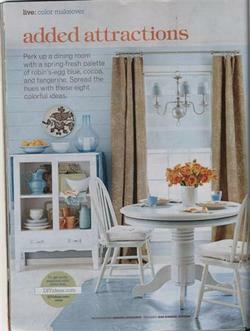 Challenge Focus: Inspiration photo from BH&G 100 Decorating Ideas Under $100 magazine. 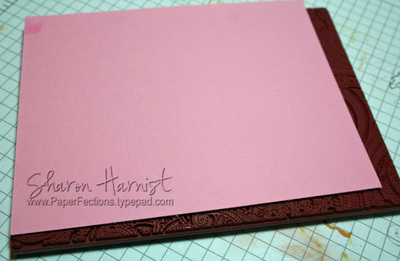 Required Element: Make an Inspiration Journal for yourself or as a gift. It can be any size from tiny to huge. 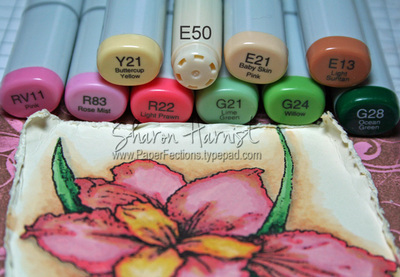 Restricted Element: No markers (SU, Copic, or any other brand), no watercolor crayons. As mentioned, I colored the butterflies with Copic's Spica Glitter pens and a brown Copic Multiliner pen (not technically markers, right?!!). The bookplate is a Spellbinders die. 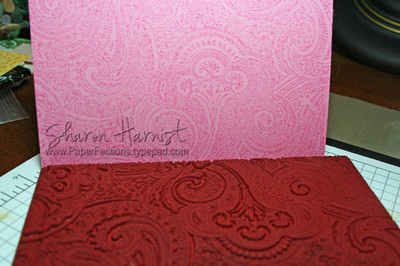 While the blue cardstock was still in the die, I colored the embossed areas thru the die with clear Spica glitter pen. After removing the die, I inked the edges of the book plate with Hazelnut Adirondack ink; it stuck to the glitter pen and gave an interesting, sparkly raised embossing! There's my favorite CHF backgrounder stamp again -- Paisley. 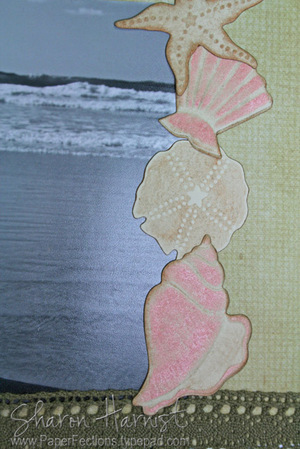 This time it's stamped with the Hazelnut ink onto Prism Sugar Cream cardstock. 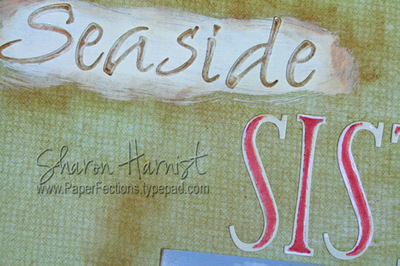 You can check out the rest of the girls' inspiration for this challenge by visiting THIS gallery at SplitcoastStampers.com. 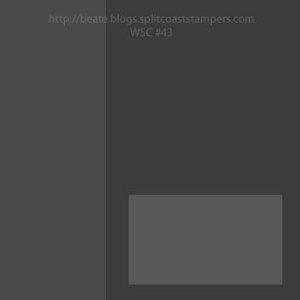 Or if that link doesn't work try SplitcoastStampers.com_Gallery and then put in the Keyword: DCI408 (for Dirty Challenge Inspired April 08) in the search box. 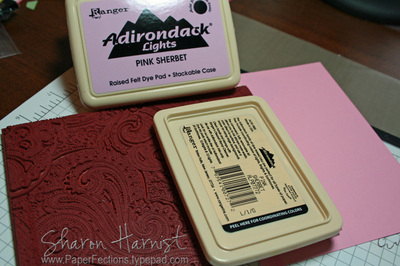 All colored cardstock is Stampin' Up and all ink is Ranger Adirondack dye ink. 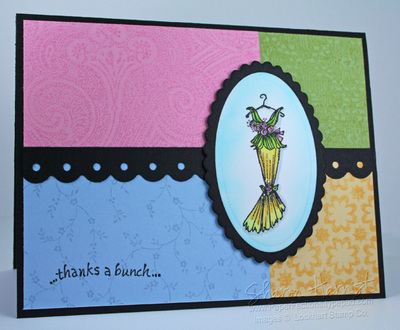 In addition to the Paisley backgrounder (Pink Sherbet ink on Pretty in Pink cardstock), I also used Scalloped Lace (Willow ink on Celery cardstock), Climbing Floral (Cloudy Blue ink on Bashful cardstock), Geometric Flowers 2 (Lemonade ink on Banana cardstock). 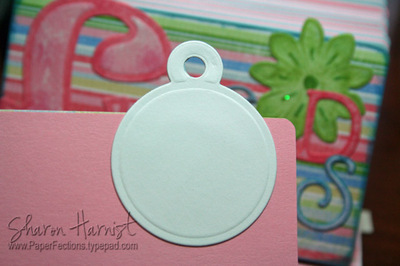 If you are not familiar with background stamps, check out my tutorial below on how I use them. No, your eyes aren't fooling you, there are two cards ... we'll get to the other one in a minute! Yellow Copic Spica Glitter Pen accents the dress and pink accents the roses. I used Copic C1 for the shadow behind the dress. I finished off my card with my favorite sentiment -- Karen Lockhart's Thanks a Bunch. The dress is colored the same way, but with an R81-Rose Pink airbrushed background. 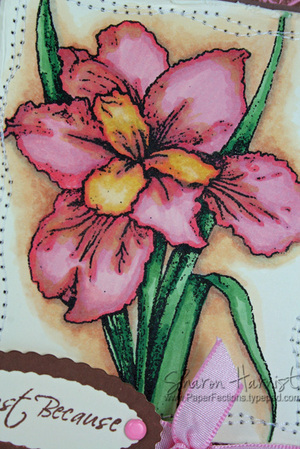 Card base is Papertrey Ink's Stampers Select White notecard. Check out the samples these wonderful bloggers made for this sketch: Cambria Turnbow, Charmaine Ikach, Jenn Balcer, Laurie Schmidlin, Lori Craig and MaryJo Albright -- and if you play along this weekend, be sure to let me know so I can check it out! 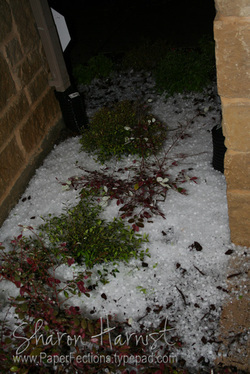 No, that's not snow -- it's hail! Thank goodness we only got pea to marble sized; some areas got golfball to softball sized and a tornado touched down in the area! 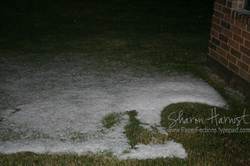 Personally, we got about 65mph winds and gushing water was coming up over our sidewalks, into the yard -- the streets were a little backed up and flooding for a while! If you need a good deal on a new/slightly hail-damaged car, I think there will be lots of sales over the next few months -- come on down! I'll be back on Sunday with another Dirty Girl Challenge! Cornish Heritage Farms' Backgrounder Blitz begins tomorrow (Apr 18) and runs thru Apr 25, when they will release a whole new batch of backgrounder stamps! Check out that link above, where you can find the details on how to enter to win some free new backgrounders! 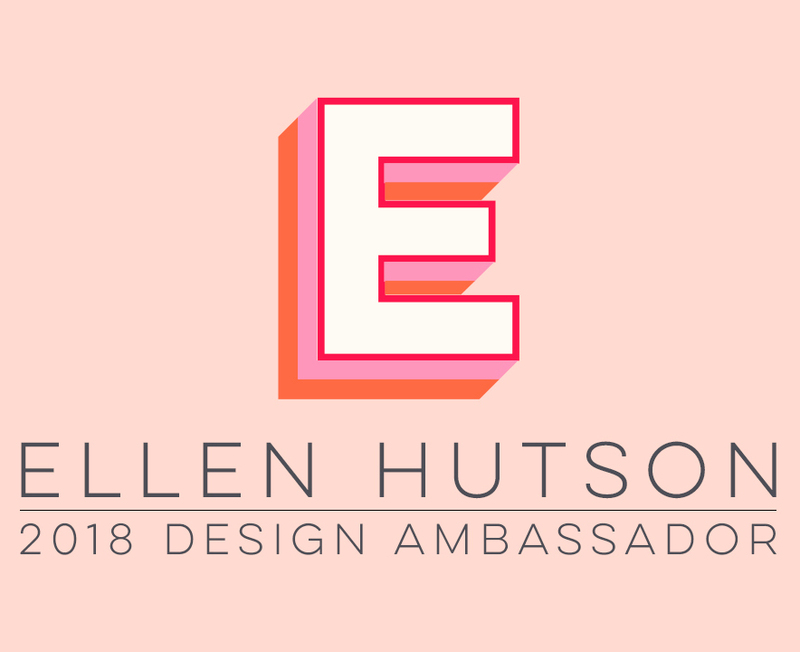 In conjunction with the Backgrounder Blitz, as a reminder, Ellen Hutson's store will have their own special going on backgrounders Apr 18-25 ... you should have received your coupon code in her e-Newsletter that should have arrived in your inbox on the 15th. Let me know if you didn't get that newsletter and I can give you some instructions on how to get your code. 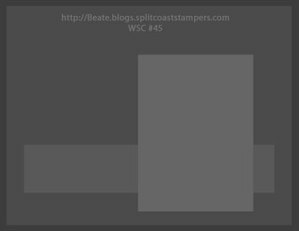 If you've never heard of or used backgrounder stamps, I thought I'd show you a quick tutorial on how I use them. The thing I like most about backgrounders is that you can have patterned paper in any color scheme under the sun and never run out! I begin by just laying the background flat on my stamping surface. These CHF backgrounders come either wood-mounted or unmounted with Smart Cushion cling mount. I prefer the unmounted simply for the ease of storage & space. 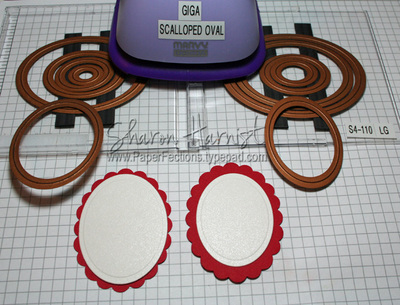 You can put the unmounted on an acrylic block but I find this method the quickest & easiest. 1. Ink up your stamp thoroughly ^ Most of the time I get good coverage with this method but if you see bare spots, you might want to try brayering the ink onto the stamp. I try to avoid this if at all possible since I don't like having something else to clean up! 3. 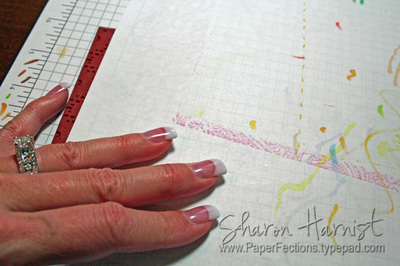 This next part is entirely up to you -- I lay a scratch piece of paper over my cardstock first, to prevent any excess ink from getting all over my hands. Then I firmly hold the cardstock down so it won't shift and rub/press down firmly all over the top of the stamp, transferring the ink to the cardstock. A perfectly inked image every time! And this one in particular is my very favorite backgrounder from Cornish Heritage Farms -- Paisley. It's the first one I ever bought. Check back in tomorrow morning after 8:30am CST and I'll show you the card I made with this backgrounder (and a few others!) for Beate's Weekend Sketch Challenge! This card uses CPS60 layout. Seems it's the season for babies and I can never have enough baby cards on hand. This sweet image is Karen Lockhart's rendition of her own grandson, Nicholas! Or if you click on the Nicholas link, you'll see him transformed into Nichole! The image is cut and matted with Spellbinders Nestabilities Classic Circles. 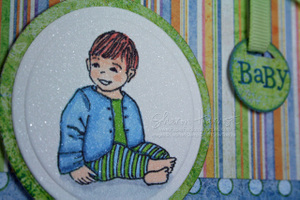 The Baby sentiment is from Papertrey Ink's Mixed Messages and is stamped on a Cuttlebug tag with Adirondack Stonewashed ink and accented with blue Copic Spica glitter pen. All circles are popped up on dimensional foam tape. Papers and striped tag are BasicGrey Oh Baby Boy and are distressed with Tonic's Edge Distresser. 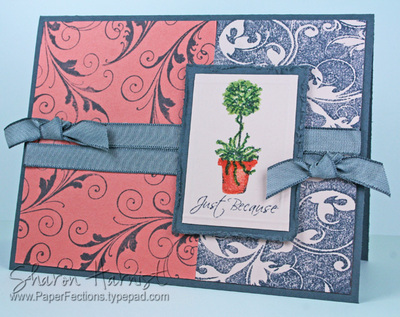 Stampin' Up Celery ribbon. The manufacturers of Dew Drops have gone up on their prices (guess they know they have a hot item, eh?!!) but Ellen Hutson has her price still the same this week (until April 21) of $4.99 per bottle. After that, they'll be going up to $5.99, so get them this week at a 17% savings! This Friday, April 18, Cornish Heritage Farms is kicking off a week-long Backgrounder Blitz, leading up to the next release of new backgrounder stamps. 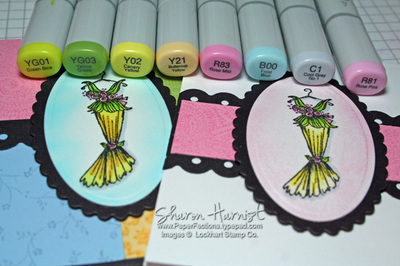 Check out THIS announcement which tells you how you can enter to win some new background stamps! Did you know Ellen Hutson also carries CHF's backgrounder stamps? She is joining in the celebration with a savings off all her backgrounders, April 18-25. You can read all about it and get the coupon code in her In Touch email newsletter that should have appeared in your inbox last night. If it didn't, you can join the newsletter mailing list at the bottom of THIS page. 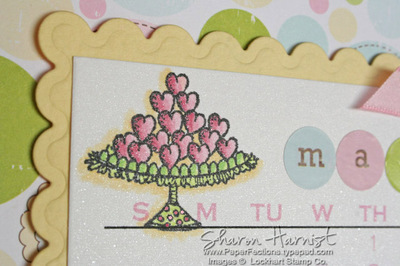 I'll be back on Friday with a card sampler of CHF backgrounder stamps! 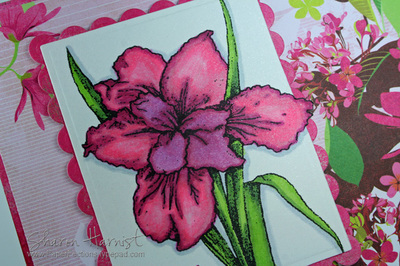 I'm off to do some stamping and hope to have some projects for you later today and tomorrow! My SMALL set of Classic Ovals is on the left (2nd largest oval shown) and my LARGE set is on the right (middle oval of the set is shown). These were the closest fits I found. I hope that helps someone out! I had forgotten I still have all these Marvy punches and would like to sell them. I'd like to sell my entire collection as a whole and as soon as I get them photographed and listed, I'll let you all know. If you happen to have an interest before then, you can email me at the link shown under my photograph at the top left of my blog. ETA: These punches are now listed on my FOR SALE page <= click on that link or the link over on my left top sidebar, under PAGES. Thanks! Happy Friday! I'll keep it short and sweet today. This is the sketch Beate created for us to work with today/this weekend. 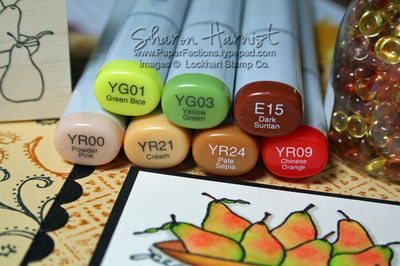 I just received this beautiful Lockhart Pear stamp that I had coveted for quite some time -- they were a joy to color! Card size is 5.25" square. 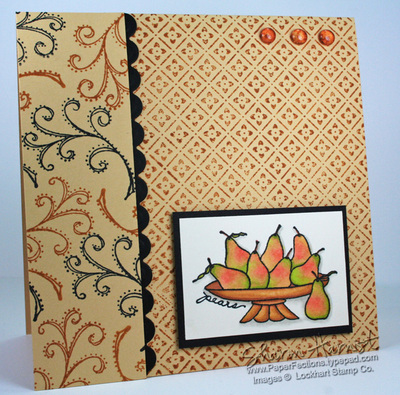 Stamps: Lockhart Pears & Millinery Embellishment Vine, Cornish Heritage Farms Pretty Pattern backgrounder. 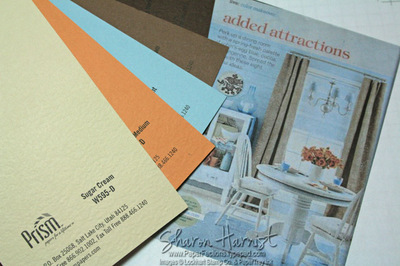 Paper: Neenah Classic Cream, Stampin' Up! Saffron & Black. Ink: Ranger Adirondack Pitch Black & Caramel, Copic Sketch markers. Accessories: Spellbinders Nestabilities Classic Scalloped Rectangles, Sunflower Dew Drops, dimensional foam tape. Check out samples made of this sketch by these rockin' blogger gals: Beate, Cambria Turnbow, Charmaine Ikach, Jenn Balcer, Laurie Schmidlin, Lori Craig and MaryJo Albright and I hope you try this sketch and enjoy your weekend!